THIS WORK LETTER ("Work Letter") sets forth the agreement of Landlord and Tenant with respect to the Tenant Improvements and Landlord's Work to be constructed on the Property. In the event of any inconsistency between the terms of this Work Letter and the terms of the Lease, the terms of the Lease shall control. All defined terms used herein shall have the meanings set forth in the Lease, unless otherwise defined in this Work Letter. 1. Landlord's Work. Landlord, at its sole cost and expense, shall perform or cause to be performed the "Landlord's Work," defined herein to mean demolition of the Existing Building and construction of two (2) concrete tilt-up building shells substantially in accordance with final plans and specifications to be submitted to and approved by the Tenant as provided herein and by the City (once so approved, the "Final Shell Plans"), which building shells shall contain only the items listed on Exhibit B-2 or shown on the Final Shell Plans (the "Building Shells"). Landlord's Work shall upon completion be in compliance with all then applicable Laws and Private Restrictions (except to the extent noncompliance is the result of Tenant requested changes in the Preliminary or Final Shell Plans). Landlord's Work shall be performed using a general contractor selected by Landlord. 2. Landlord shall cause XYZ Architects ("Architect") to prepare initial plans for construction of the Building Shells based on the shell specifications attached as Exhibit B-2 and the site plans attached as Exhibit B-3 (the "Preliminary Shell Plans"). The Preliminary Shell Plans shall provide for accommodation of Tenant's sewer line in the Buildings' slabs and may incorporate either of the site plans attached at Exhibit B-3 or be a combination thereof, as reasonably approved by Landlord and Tenant as set forth below, provided that in no event shall the design of the Project provide for a lobby larger than 6,000 square feet or for a number of parking spaces less than 3 spaces per 1,000 (in Landlord's discretion, provided that in no event shall the parking be less than 2.75 per 1,000) Rentable Square Feet (excluding the Rentable Square Feet of the lobby). Landlord shall submit the Preliminary Shell Plans to Tenant for Tenant's approval. Tenant will provide written approval of the Preliminary Shell Plans within five (5) days after such submission. If Tenant disapproves any part of the Preliminary Shell Plans, the disapproval shall include written instructions adequate for Architect to revise the Preliminary Shell Plans. Such revisions shall be subject to Landlord's approval, which shall not be unreasonably withheld, provided that neither Landlord nor Tenant shall be entitled to request or require changes to the Preliminary Shell Plans to the extent inconsistent with Exhibits B-2 and B- 3. Tenant will finally approve the revised Preliminary Shell Plans within two (2) business days after submission thereof to Tenant. If Tenant fails to approve the Preliminary Shell Plans within the applicable periods set forth in herein, then (A) Landlord shall not be obligated to commence construction of the Building Shells, (B) Tenant shall be responsible for any resulting delay, and the cost of such delay, in Landlord's completion of the Building Shells and delivery of the Leased Premises, and (C) any such delay shall be deemed a Tenant Delay (as defined below). After Tenant's approval of the Preliminary Shells Plans, such plans shall be submitted to the City for approval. 3. After approval by the City of the Preliminary Shell Plans, Landlord shall cause Architect to prepare Final Shell Plans. Tenant will provide written approval of the Final Shell Plans within five (5) days after such submission. If Tenant disapproves any part of the Final Shell Plans, the disapproval shall include written instructions adequate for Architect to revise the Final Shell Plans. Such revisions shall be subject to Landlord's approval, which shall not be unreasonably withheld. Tenant will finally approve the revised Final Shell Plans within two (2) business days after submission thereof to Tenant. If Tenant fails to approve the Final Shell Plans within the applicable periods set forth in herein, then (A) Landlord shall not be obligated to commence construction of the Building Shells, (B) Tenant shall be responsible for any resulting delay, and the cost of such delay, in Landlord's completion of the Building Shells and delivery of the Leased Premises, and (C) any such delay shall be deemed a Tenant Delay (as defined below). Landlord's Work shall be deemed to have been "Substantially Completed" or to have attained "Substantial Completion" as and when hereinafter set forth in this subparagraph 1(c). This Landlord Waiver and Agreement (this "Waiver") dated _______________, 200_, is entered into by and between _________________ a _____________ limited ___________ ("Landlord") and ___________________ ("Secured Party"). 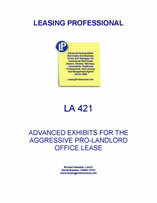 During the term of the Real Property Lease, and subject to Landlord's interest in the Personal Property, if any, at the expiration or earlier termination of the Real Property Lease, the Personal Property shall remain personal property and severable from the Premises and shall not become part of the Premises or construed as a fixture at the Premises to the extent that no funds of Landlord (including but not limited to the [Tenant Improvement Allowance] as defined in the Real Property Lease) have not been utilized to pay for the Personal Property or the financing thereof. So long as Tenant occupies the Premises and is not in default under the Real Property Lease, Secured Party may enter the Premises at any time or from time to time upon reasonable written notice to Landlord and in compliance with the terms of the Financing Agreement for purposes of inspecting and/or removing any and all of the Personal Property in the exercise of its rights and remedies arising from the Financing Agreement. In the event of a default by Tenant under the Real Property Lease, Secured Party shall obtain Landlord's prior written consent prior to entering the Premises. Landlord shall notify Secured Party in the event the Personal Property remains at the Premises after either (i) Tenant is evicted from the Premises or (ii) Tenant abandons (as opposed to vacates) the Premises prior to the expiration of the Real Property Lease. Secured Party shall have 15 days to remove the Personal Property from the Premises after notification of such action from Landlord. If Secured Party has not removed the Personal Property within such 15 day period, Landlord shall have all rights regarding the Personal Property accorded to it by law and/or pursuant to the Real Property Lease and Secured Party shall have no further rights regarding such Personal Property. After Tenant has vacated or been evicted from the Premises, and if Landlord in its sole discretion allows the Personal Property to remain at the Premises for any period of time, Secured Party shall be liable for holdover rent for the total amount of time the Personal Property remains at the Premises after such eviction or vacation. For purposes hereof, "holdover rent" shall mean 200% of the rent in effect under the Real Property Lease for the period immediately prior to such vacation or eviction. If Secured Party exercises its right to remove the Personal Property from the Premises as provided herein, Secured Party shall repair any damage to the Premises and restore it to its condition existing prior to installation of such Personal Property. Landlord shall have the right to require Secured Party to post a bond acceptable to Landlord to cover the potential cost of such repair prior to removing any such Personal Property. No auction or sale of the Personal Property shall be conducted by Secured Party from the Premises without Landlord's prior written consent, which consent Landlord may withhold in Landlord's sole and absolute discretion.